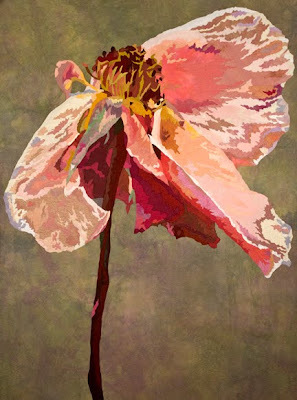 Well, I'm back from New York & had a whirlwind 5 days of art! 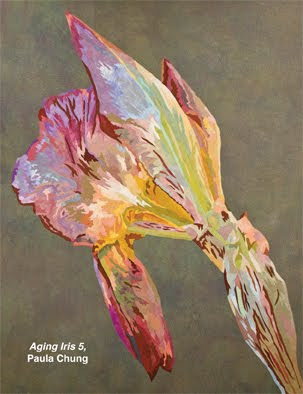 My painting buddy, Claudia & I went to 5 art museums, visiting the Metropolitan Art Museum 3 times!!! 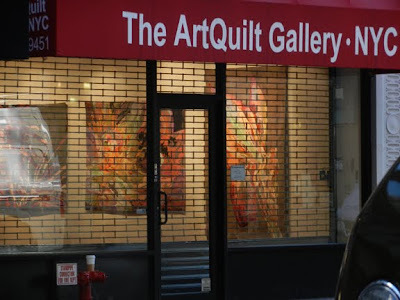 But best of all, my opening reception at the ArtQuilt Gallery NYC was grand! I had such a great time & met some wonderful people. 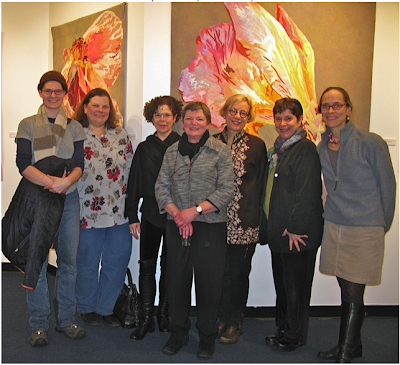 Above is a photo of me with some of the members of the Manhattan Quilter's Guild. 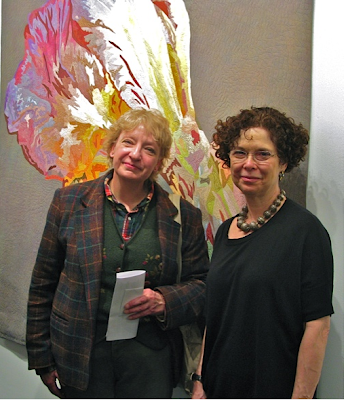 Below is my friend, Claudia, with Paula Nadelstern. We had a wonderful time at the reception. 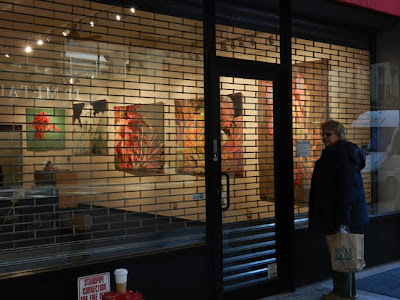 As everyone was closing up and we were leaving, I took some last minute photos to remind me of the gallery and how my work looked through the windows. The gallery lights just popped out of the night like giant lanterns. 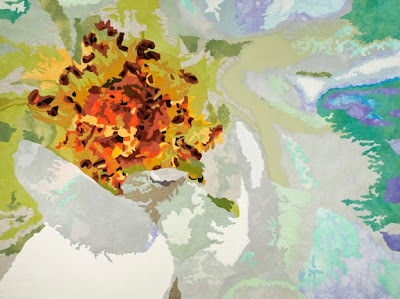 An Article about the Gallery & My New Show! 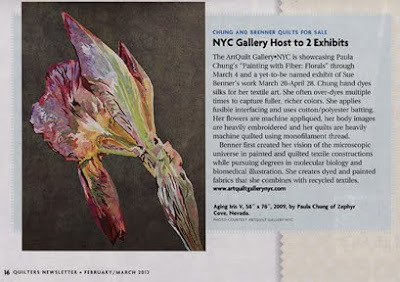 I just received a copy of Quilters Newsletter and saw a new article about my work and the gallery (ArtQuilt Gallery NYC). 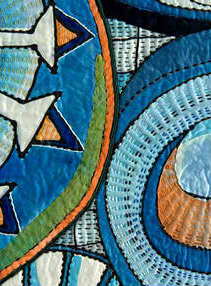 I'll be from January 23 through March 3 and Sue Benner is the next featured artist. 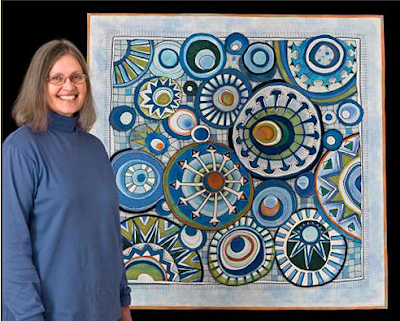 Her work is wonderful. Hope you can check it out both of us! Among the 11 pieces being shown is some work that many haven't seen for a long time. They're older pieces that I made in 2007. 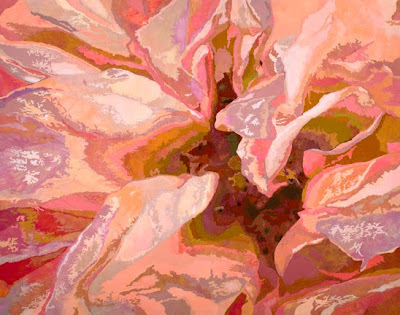 One piece, Pink Rose I won 3rd place in abstracts at IQA in Houston that year. 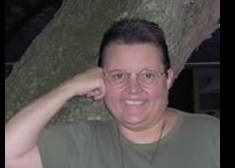 That was my first time in Houston and I was so fortunate to meet up with Jamie Fingal (www.jamiefingaldesigns.com). I was all by myself & pretty much lost. She was kind enough to invite me to her dinner group and it was great fun! They embraced me as one of their own and I was so moved by that. I think quilters are that way. 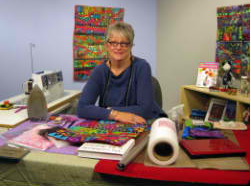 When I was accepted to Quilt National '09, I went by myself again, and again quilters embraced me. I met some wonderful new friends. Among my first acquaintances that first night, was Marianne Burr (www.marianneburr.com). 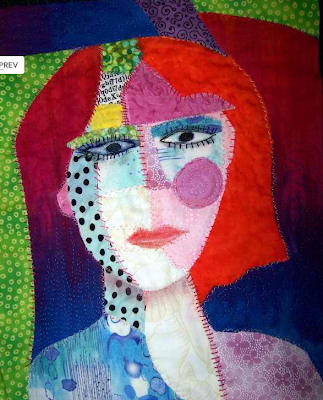 She does incredible silk dye painting & embroidery on whimsical pieces using geometric shapes. I've been working for months on 2 new pieces for my New York show. 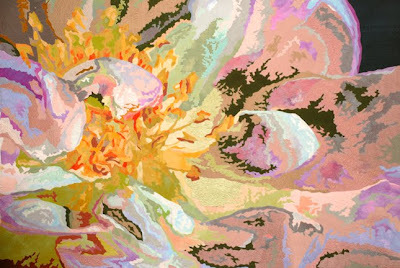 I had done a commission piece of an apricot rose and enjoyed working with that palette, so I created 2 more apricot roses. I had had a lot of silks dyed for that project, but found I needed even more! Dyeing fabric is like having Christmas everyday. I am always so excited to wash out the silks. Because I want to keep the lovely sheen of the silks, I use vinegar instead of soda ash in the dyeing process. I also gently wash out the dye by hand after processing which can be very tedious (especially if they're dark violets!) and line dry. But it's all worth it when I see the marvelous color! And often I overdye many times, to get more complex, deeper color. My New Show in New York! 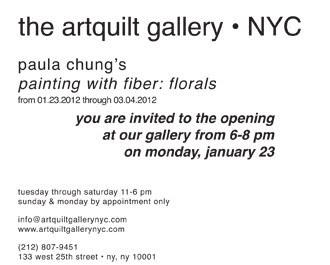 I'm so excited to show two new pieces, along with nine others at a new gallery in New York City, The ArtQuilt Gallery-NYC. 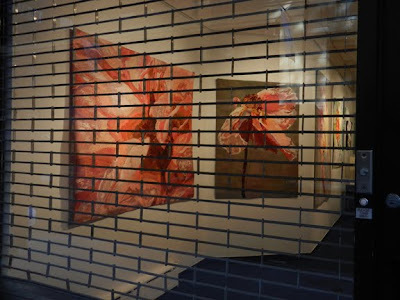 I'm thrilled to have been asked and hope you'll check out their website and if possible stop by the gallery, if you're in New York City. And I'm excited to spend some time in New York City seeing as many art museums as I can fit into 4 days. It's going to be a whirlwind trip. Hope the weather is still nice!